Lisa's Carolina | Handmade: Which lighting would you choose? 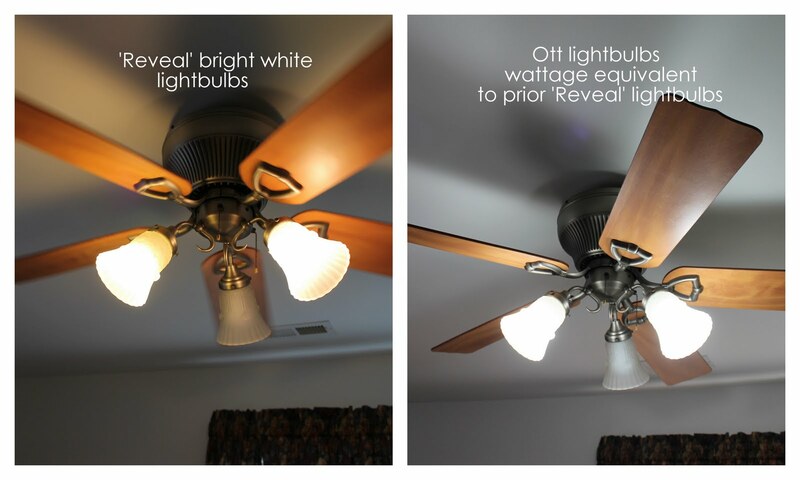 Which lighting would you choose? or the lighting on the right? I've been using Ott products for the last couple of years, but never thought of replacing existing lightbulbs, like ceiling fan lights, with their bulbs. OttLite bulbs produce a more natural light that helps reduce eyestrain..... to me it's a brighter, cleaner, easier-to-see, daylight-light. Sandra purchased her OttLite bulbs at Lowe's and I've seen them at Hobby Lobby and other craft stores..... but yesterday I found these at Hancock Fabrics for 40% off. This is great because they are a little pricey at $9.99 each for a 60 watt equivalent bulb. Also, Hancock Fabrics had enough OttLite bulbs in stock for my needs. Just thought I'd pass this little tip on. It's so much easier to see now while I work on my 'piecework treasures'.